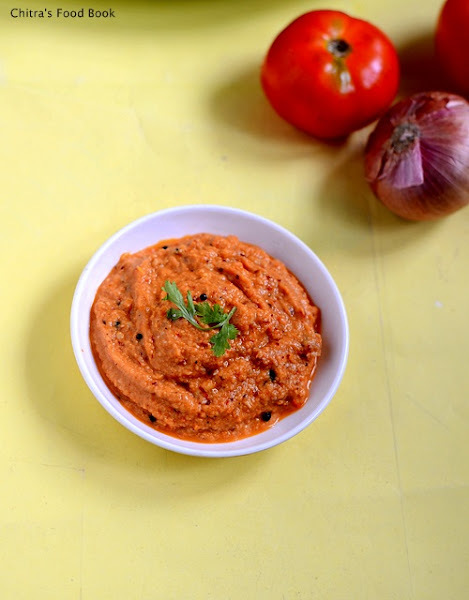 I tried this recipe from jey's blog..I usually make tomato chutney using chana dal .This recipe is also similar to that but she used fried gram dal and garlic which made me to give a try. It was very nice with idli. . As i had less onions in my pantry , i used more tomatoes & less onion. The actual recipe suggested to use equal number of onions & tomatoes.Try any based on ur liking. Heat 1 tbsp of oil in a kadai and add the red chillies & garlic flakes.saute well and then add the sliced onions. Saute until the onions turn transparent.Then add the chopped tomatoes.Saute till tomato turns mushy. Add salt for quick saute. At last add the fried gram dal and switch off the flame. Grind to a smooth paste and temper with ingredients given above. Serve with hot idlies !! Superb combo of idli and tomato chutney. Nice combo of idli n dosa!! Nice chutney Chitra! I tried it today, it was yummy, thanks for sharing! Tempting and delicious chutney.. My favorite. Lovely click the last one and very tempting chutney too. Love to have two more idlies with this chutney. 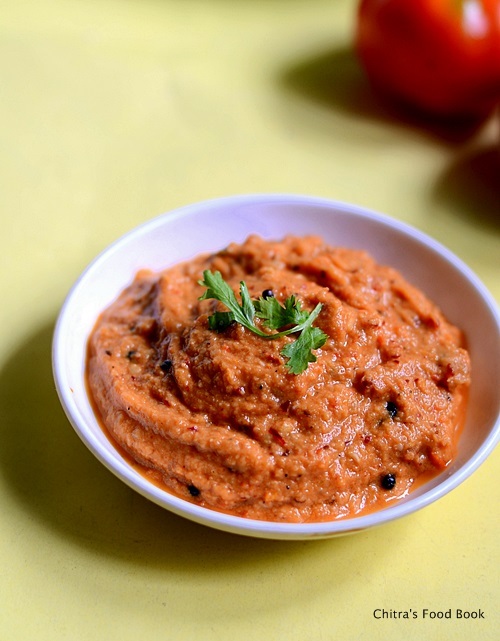 your chutney looks amazing and with idli – it must be the best.